In March 1942, Rena Kornreich and 997 other young women were rounded up and forced onto the first Jewish transport of women to Auschwitz. 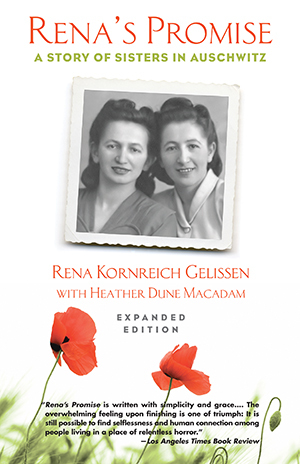 Soon after, Rena was reunited with her sister Danka at the camp, beginning a story of love and courage that would last three years and forty-one days. From smuggling bread for their friends to narrowly escaping the ever-present threats that loomed at every turn, the compelling events in Rena’s Promise remind us that humanity and hope can survive inordinate brutality.